At lunchtime, on Tuesday, February 22nd 2011, Christchurch was struck by a 6.3 magnitude earthquake, centred around the seaside town of Lyttleton, 10km south-east of the city centre. 185 people were killed and hundreds of buildings either damaged or destroyed. Situated on a constantly-shifting fault line, as is much of the country, Christchurch's vulnerability to tremors is nothing new, and the city has suffered more than its fair share of scares. Just six months before, a quake of 7.1 magnitude had rocked the city which, although structurally devastating, and much stronger than its successor (which was, technically, an aftershock of this one), did not cause any direct fatalities, mainly because it struck in the early hours of the morning, and not at the height of a busy weekday lunchtime. A state of emergency was declared immediately after the February quake, which remained in place until April, and several severe aftershocks hit the city in the days, weeks and months following, most notably on June 11th and December 23rd 2011. In the disaster, the city lost many of its oldest buildings, and two of its most recognisable structures - Shag rock, and much of Christchurch Cathedral – were extensively damaged, with areas like Cathedral Square sustaining some of the most severe damage, and which remains cordoned off to visitors. In the 'Four Avenues' area of the main CBD, over 3,000 buildings were designated 'Red' or 'Yellow' Zone, the most serious categories of damage, including the prestigious Hotel Grand Chancellor, and the city's tallest office tower at PriceWaterhouseCooper. Outside Christchurch, the eastern suburbs took much of the brunt of the earthquake, in particular the resort of Lyttleton, where the quake was centred. There, 60% of the town's main street was extensively damaged although, incredibly, nobody died. Three people died in the neighbouring coastal village of Sumner, though much of the village was evacuated the same night, after cracks were discovered in the hillside, thus avoiding any more loss of life as subsequent rock slides hit houses and buried streets in the days afterwards. Nearby Redcliffs, which had avoided any major damage in the main September quake, wasn't so lucky during the February aftershock, when part of a cliff collapsed onto the village, crushing buildings and surrounding streets. Even 200km south, on the Tasman Glacier, the rippling effect of the earthquake caused thirty million tonnes of rock and ice to fall from the glacier into Tasman Lake, with boats being battered by tsunami waves up to 3.5 metres high. In the weeks and months that followed the earthquake, various fundraising events were held to raise money to help the displaced, sick and homeless, including rock concerts, sports events and auctions. 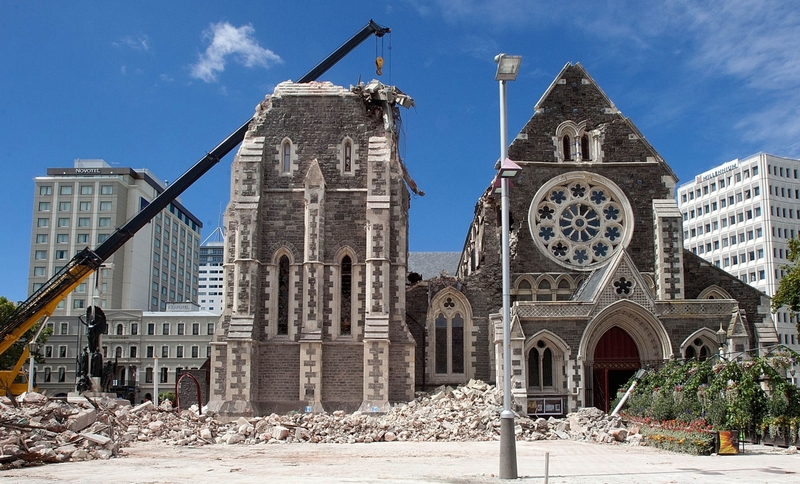 The financial cost of the earthquake, not just to Christchurch, but to New Zealand as a whole, is incalculable, but within weeks, the city's residents and businesses, where possible, were up and running again, refusing to give in to nature's cruel streak.